The DEWALT DCK421D2 20V MAX Lithium-Ion 4-tool kit features four powerful tools for a wide variety of jobs and projects. The fast performance of the DCD780 1/2-inch drill/driver pairs well with the compact power of the DCF885 1/4-inch impact driver to provide a well-rounded pair of tools that help everyone--from steel stud framers and contractors to cabinetmakers and plumbers--work their way through a variety of applications. The DCS393 6-1/2-inch circular saw features a powerful motor that makes the most demanding cuts with ease. Rounding out the kit, the versatile DCL040 worklight delivers 110 lumens of light output with an efficient LED bulb and head that rotates 120 degrees. The DCD771C2 20V MAX* Lithium-Ion Compact Drill/Driver Kit is lightweight and compact for working in tight spaces for long periods of time. High-speed transmission delivers 2-Speed variations allowing users to choose the level of performance needed for various applications. 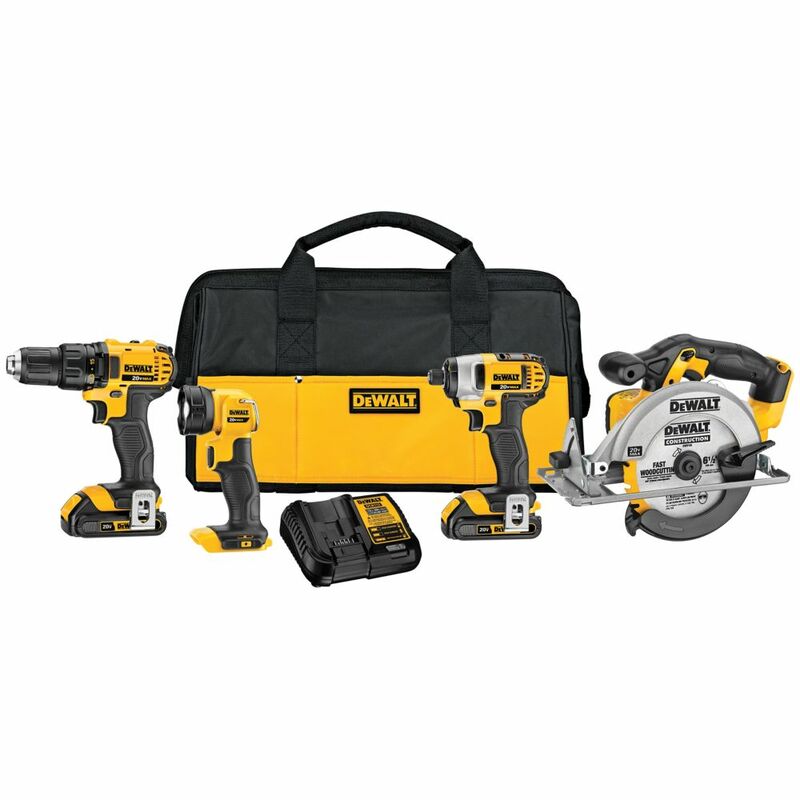 20V MAX Lithium-Ion Cordless Combo Kit (4-Tool) with (2) Batteries, Charger & Bag The DEWALT DCK421D2 20V MAX Lithium-Ion 4-tool kit features four powerful tools for a wide variety of jobs and projects. The fast performance of the DCD780 1/2-inch drill/driver pairs well with the compact power of the DCF885 1/4-inch impact driver to provide a well-rounded pair of tools that help everyone--from steel stud framers and contractors to cabinetmakers and plumbers--work their way through a variety of applications. The DCS393 6-1/2-inch circular saw features a powerful motor that makes the most demanding cuts with ease. Rounding out the kit, the versatile DCL040 worklight delivers 110 lumens of light output with an efficient LED bulb and head that rotates 120 degrees. 20V MAX Lithium-Ion Cordless Combo Kit (4-Tool) with (2) Batteries, Charger & Bag is rated 4.8 out of 5 by 43. Rated 5 out of 5 by RazorbacDoc from Great package for a great product. Works perfectly as I... Great package for a great product. Works perfectly as I expected. Rated 5 out of 5 by Louis from Great tools period. ... Great tools period.